Guest Blogger: Working Moms CAN Cloth Diaper! Welcome to our new contributing blogger! LuSa Organics: Great ingredients, great products! When I brought my first son home, I was armed with all the soap and goop the hospital sent home. I am an ingredient label reader, and after a week or so thought to look at what I was slathering on my precious baby's skin. Turns out there are a LOT of chemicals in most baby products. Ew! I started looking for alternatives and discovered an amazing LOCAL company: LuSa Organics! 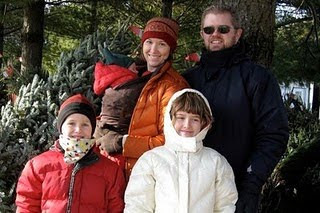 A family-run business, LuSa strives to be as natural as possible. Their products are decadent with zero guilt. The first product I tried was the Booty Balm. What a difference it made! I remember one time in particular my oldest decided that he LOVED diced tomatoes....and my husband realized far too late that so much of such an acidic food probably wasn't the best...unfortunately poor baby ended up looking like a very grouchy baboon. We slathered him liberally with the Booty Balm and it seemed to help him feel better almost instantly. We've used it many, many times since and it has never failed to impress and heal our little ones' bums quickly. I also use the Baby Wipe Juice (Diaper Wipe Concentrate) for my cloth wipes. I add a small amount to one of those handy spritzer bottles the hospital sends home for mamas, fill with water, and spray the wipes as needed. I've also added it to a tub and kept damp wipes that way, but the bottle method works better for us. The wipes smell great, clean and fresh. Seems like the solution is soothing and moisturizing, too. I tried the Sleeping Potion on my older son last night, and it smells DIVINE. Very calming, relaxing scent. I'm sure the aromatherapy helped, he seemed to sleep less fitfully! The last product I've used is the Labor Massage Oil. I was lucky enough to have a massage therapist on hand for my youngest son's birth, and she used the oil on my neck and shoulders during labor. The aromatherapy was amazing -- so calming and empowering. I loved it, and will recommend it to any mom-to-be. The massage certainly didn't hurt, but the oil was a definite bonus. Bumkins All In One Diaper over 10% off! Now only $15.90 - $14.90! CELEBRATE DR. SEUSS'S BIRTHDAY ON MARCH 2nd!!!! Bumkins All In One Diapers: Celebrate Dr. Seuss!! All "Items of the Week" run from Wednesday to Wednesday. The Thirsties Duo Diaper is a two-piece diapering system that has an absorbent insert and a waterproof sleeve diaper. 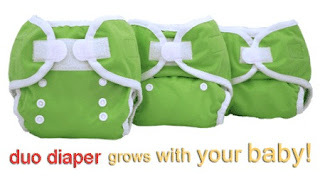 Only 2 sizes are needed to diaper your baby from birth to potty training! One-size diapers are usually too big on the average newborn and too small for most toddlers over 2. So they aren't actually one size after all. You will probably need a different diaper for your newborn and another for your toddler. 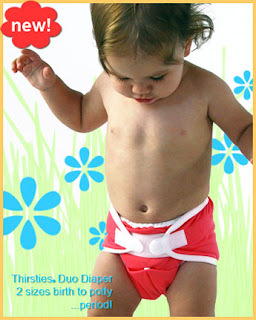 But the Thirsties Duo Diaper comes in 2 sizes that will truly take your baby from newborn to potty! Thirsties Duo Diapers have an adjustable rise so they will fit whether your baby is tall or short, thin or chunky. The Thirsties Duo Diaper also has leg gussets that will keep those messes contained. It is made of a completely waterproof fabric that is breathable, pliable, and very comfortable. 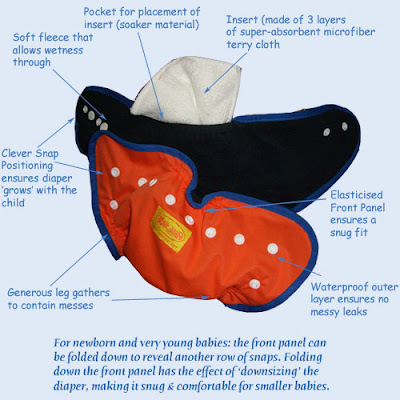 The soft microfleece liner on the inside protects your baby's skin from wetness. The Thirsties Duo Diaper has a sleeve design which means there is an opening on both sides. This makes it easy to stuff and also easy to clean. You don't need to remove the soiled inserts when washing. Just toss the dirty Thirsties Duo Diaper in the laundry and the insert will agitate free from the diaper in the washing machine. Thirsties Duo Diapers are easy to use! Stuff the insert in the sleeve of the diaper and wrap it around your baby. Secure the diaper with the hook-and-look closures for an easy way to get a perfect fit. Thirsties' leg gussets ensure leak-proof protection and the bindings are soft against baby's skin. The fold-over tabs protect the hook-and-loop-closures in the wash.
Thirsties was generous enough to sponsor this week's giveaway! To enter to win your free Thirsties Duo Diaper in your choice of size and color, you will receive ONE entry for EACH option below (you MUST leave a comment for each option saying what you did and where). This means you can get multiple entries increasing your chance to WIN! (each "Weekly Giveaway" may be different): 1. Become a subscriber of Nicki's Diapers Blog or if you already are post it 2. Become a Fan of Nicki's Diapers Facebook page 3. Post a comment on Facebook about Nicki's Diapers including a link to any page on Nicki's Diapers 4. Follow nickisdiapers on Twitter 5. Tweet about Nicki's Diapers including a link to any page on Nicki's Diapers 6. Blog about Nicki's Diapers including a link to any page on Nicki's Diapers 7. Talk about Nicki's Diapers on a Forum including a link to any page on Nicki's Diapers 8. Grab one of our buttons and put it on your blog. 9. What is your favorite color. Congratulations to The Logans on winning this week's giveaway! You've won a red Moby Wrap! Please email annie@nickisdiapers.com within 1 week to claim your prize! Thirsties Duo Diaper: Two Sizes May Be Better Than One! Have you experienced the frustration of having to find a newborn diaper for your baby to wear before they grow into their one-size diaper? How about having a tall toddler who out grows the rise of their one-size diaper before they're ready to potty train? Thirsties has come up with a diapering system that will address those problems. My oldest son was 3 months old when we started cloth diapering so we were able to use one-size pocket diapers from the beginning. However, when I was pregnant with my second son, I realized we'd have to find a diapering system to use until he grew into his brother's one-size diapers. Most one-size diapers don't fit till baby is close to 10 pounds. Lucky for me (well, maybe not so lucky:)) I have big babies, so that time from birth till 10 pounds is only a matter of a month or so. If you have more petite babies, that can be months! Using disposable diapers for those first couple of months is always an option, but with a newborn going through 12+ diapers a day, that can be very expensive! Thirsties has introduced a wonderful new diapering system called the Duo Diaper. They were so kind and gave me a size 2 Duo Diaper to try out on my boys. I'm so thankful I gave this diaper a try, it's one of my absolute favorites now! The Duo Diaper is a 2-piece system that has a super absorbent insert (a combination insert of thirsty microfiber and jersey hemp) and a water-proof outer pocket. The pocket comes in 2 sizes (size 1 and size 2) and each size has 2 sets of rise adjusting snaps, making 3 sizes per diaper! This diaper will absolutely fit the average newborn from birth! One-size pocket diapers are extremely bulky on newborns. The size 1 Duo Diaper starts at 6 pounds and goes up to 18 pounds. That means half as much bulk! The size 2 Duo Diaper starts at 18 pounds and goes up to an astonishing 40 pounds! No more plumber crack from your toddler who is outgrowing the rise of their one-size diaper. We've trusted Thirsties covers with their super gussets to contain my sons' EBF poop and you'll be happy to know they've used their trademark gussets on their Duo Diapers, too. And another very cool feature (this diaper is jam-packed with them, hey?!) , a pass-through sleeve that makes for easy insert stuffing AND allows the insert to agitate itself out in the wash. No touching dirty inserts! One of my favorite parts of this diaper and other Thirsties products in the waterproof material on the inside of the diaper that prevents the insert (or prefold in the case of their covers) from peaking out the top. That means my boys, who are tummy sleepers, can wear this diaper overnight and I'm not worried about moisture wicking onto their jammies and sheets! I'd never pass at an opportunity to show my kids off. Here is my youngest son wearing a size 2 Duo Diaper. He's about 20 pounds. The diaper is on the tightest setting for him. Here is my older son in the same size 2 Duo Diaper. He's about 30 pounds and wears it on the middle setting. Still lots of room to grow! My overall impression? This is a quality diaper and an ingenious idea! Why buy a newborn diaper, a one-size diaper and later on a larger diaper for your toddler when you can just buy 2 sizes of Duo Diapers and be assured of a great fit?! This never leaked on my boys, still looks as new as the day I got it and is a cinch to care for. To find out more about the Thirsties Duo Diaper and other great products from Thirsties, request a FREE copy of their catalog or visit their facebook page! Check back on Thursday for your chance to win a Thirsties Duo Diaper in your choice of size and color! When my husband and I first told people that we were going to switch from disposable diapers to cloth diapers, most people responded with, “You’re going to do what? 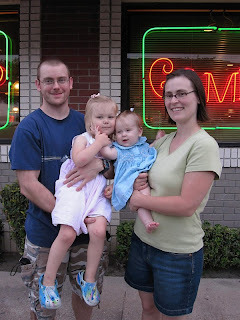 !” We were told that we wouldn’t last a month and that it was dirty, hard and too time consuming. At the time, I was staying home with our daughter who was 7 months old. Once we got a washing routine down, diaper laundry was easy and, in a weird way, relaxing. We continued this way for about 8 months. At that time, I got a job offer and we moved two hours away. I went from being home to working 40 hours a week. Those same people who told me we wouldn’t last a month just knew that I would definitely quit cloth diapering when I went back to work. I was also told that it was impossible to find a daycare that would use cloth diapers. Luckily, I went back to work at a daycare center and my daughter went with me. I was hesitant to ask the director about bringing cloth diapers because of everything I’d heard. When I did ask she responded with, “That’s not a problem at all! 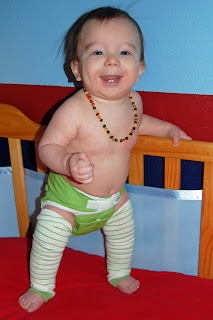 We actually have two other kids who use cloth diapers as well.” What a relief that was! All we had to do was bring in a wet bag and make sure we took the dirty diapers home with us at the end of the day. Easy! The laundry routine when I was staying home vs. working was no different. We continued to do diaper laundry every two days. I would throw the dirty diapers in as soon as we got home to rinse and then I’d start supper. Before we ate supper, I’d start washing them. I’d rinse them again before we put our daughter to bed and throw them in the dryer before we went to bed. In the morning all I had to was stuff the few that we’d need for daycare and throw them in the diaper bag. It took no more time than when I was staying home. When we had to eventually switch our daughter to another daycare I was worried again about finding a daycare that would be okay with the cloth diapers. I’ll tell you that not a single daycare we called said they would have an issue with them. My advice when it comes to finding a daycare who will take the cloth diapers is to take in some easy to use pockets or AIO’s and SHOW them! I really think when people hear “cloth diapers” they think only of prefolds, pins and rubber pants. Everyone we showed exclaimed over how cute they were and that they were great! Don’t let anyone tell you that working full-time and cloth diapering just won’t work. It will! Heather (who was also our very first Mom of the Month!) lives in Nebraska and has a 2 1/2 year old daughter, Madelyn. BumWear One Size Pocket Diaper over 10% off! Now only $15.95! All "Items of the Week" run from Wednesday to Wednesday. The Moby Wrap is one of the most comfortable baby carriers on the market! The design uses your entire back, as well as your shoulders to carry the weight of your baby. Unlike other carriers which have narrow straps and may only go across one shouder, the Moby Wrap is a wide stretchy piece of fabric that is wrapped over both shoulders. It is super comfortable and very easy to wear. There are no buckles, snaps or other fasteners. It is easy to adjust the fit by varying how tightly you wrap yourself and your baby. The Moby Wrap is an optimal baby carrier for premature infants. Preemies are often prescribed to practice "kangaroo care" and this skin to skin practice used to increase birth weight can be easily achieved while wearing this baby carrier. The Moby Wrap is also long enough to adapt to your growing baby and can hold up to 45 lbs (most people feel comfortable carrying up to 35 lbs). The Moby Wrap is very versatile! You can wear your Moby Wrap in many different ways. Wear your baby facing you, facing the world, sideways or on your back. When not being used as a carrier you can use your Moby as a blanket, pillow, or anything else that comes to mind. Click here for wrapping instructions. Congratulations to Katie (Twitter account K8tmama) on winning this weeks giveaway! You've won a Bumkins Long Sleeved Bib in Red Farm Animal Print. Please email annie@nickisdiapers.com within one week to claim your prize! Now, I want to preface all this by saying I never thought I would be a "babywearer". My first two children were good sleepers and my oldest often cried when I picked her up she loved being down and looking around so much! But, my last baby would just not sleep unless he was next to his mama. While I loved snuggling him up I couldn't spend all day on the couch with him or with a baby in one arm while I was trying to cook, do laundry and all the other things a mother of three has to get done in one day. I needed an extra pair of arms and the Moby was just that for me! I'll admit I was a bit intimidated at the thought of a wrap but at the same time I loved how snuggly and content my friends' babies seemed in them so I decided to give it a try. I got my Moby home, took it out and was determined to give it a good try - I wanted to love it. I practiced wrapping a few times then decided to actually put my baby in it. It was love at first wrap :) He snuggled right into me and after just a few minutes fell right to sleep. For the first time since he was born I had a sleeping baby and two free hands! My love affair with my Moby and wrapping my baby grew. I got really fast at wrapping by the end of the first week and found myself just wrapping it on in the morning and wearing it around the house all day putting baby in and out of the Moby as I needed to. I'd put it on under my coat before leaving for the store and then just pop him in car side and he was as content as could be while I did my shopping. As you can see in the photo, I even got to go with the rest of my family to get our Christmas. Before the Moby I had images of me trying to awkwardly push a stroller through the small forest of trees but this was so much better. All in all I couldn't be happier with my Moby. It is soft, snuggly, supportive, machine washable - everything I wanted. I did realize after the first time with the Moby that I did need to dress a little lighter because the Moby was essentially another layer of clothing but I'd take that any day for a free pair of hands AND a content little boy all day long :) Sarah lives in south-central WI and is the lucky mama to three beautiful children. For your chance to win your own Moby Wrap, check back on Thursday for this week's giveaway! I'm so excited to join up with the fabulous staff here at Nicki's Diapers. The knowledge and care they bring is wonderful to behold, and I'm honored to be a part of it! When I was pregnant with my first child, one of the first things I noticed was how intense people were about their decisions and how hard they were on themselves if they "failed" at something they had decided to do or not do. The stress that mothers especially pile on themselves is astounding -- they are GOING to have a natural childbirth. They are GOING to breastfeed. They are GOING to have a perfect, healthy, infant and maintain a perfect, clean household...well, that's not real life. In real life, sometimes you need some painkillers even if you decided you wouldn't. Sometimes you need a little more support to breastfeed successfully than you thought you would. Sometimes you need to be flexible and put off dishes for a day (or three). I noticed these things and decided that I didn't need that extra stress -- I was stressed enough about being a mom after a difficult pregnancy, why add to it? I decided that I was going to keep an open mind and TRY. I was relaxed about childbirth, and had a beautiful hospital birth that I am 100% comfortable and happy with. I was relaxed and open-minded about breastfeeding, and didn't stress out when it didn't come naturally. I was just trying, after all, so I was able to TRY new techniques and ask for help, and managed to work things out. Had I been stressed out, I probably would have had far less success and would have felt negatively about my "failures" rather than pleased with my decisions in the end. When it came to cloth diapering my first son, I decided once again that I'd TRY -- but I wasn't going to stress myself out over it. So I bought a couple things here and there, a few covers, a handful of prefolds, and half-heartedly gave it a go. Looking back, I didn't have near enough supplies or accessories to make it work, and thus I stopped. I liked the idea of cloth diapering, I just hadn't really committed to it. Flash forward to my second son, and my husband and I are now seasoned, veteran parents. By this time we've TRIED everything and have found what works for our family. We decided, together, to commit to cloth diapering both boys this time around. I did a bunch of research and realized that in order to TRY cloth diapering, you really have to give yourself a fair shot. Buy enough diapers to make it full-time. Buy enough accessories to make it easy on yourself. We went to Nicki's Diapers and bought up our whole system, and really prepared ourselves to give it a good, solid try. This time, it worked. We had set ourselves up for success and are very pleased with our decision. There have been bumps in the road, and tweaks of what really works for us, but that's expected. Now I can say I've tried just about everything in the world of cloth diapers, too! Over the course of the last 28 months of parenthood, I've evolved into a breastfeeding, cloth diapering, babywearing, attachment parenting mama and I couldn't be happier. We have a new writer on board with us here at Nicki's! A big WELCOME to Casey! We look forward to all you have to bring to the Nicki's Diapers Blog! The Bumkins Long Sleeved Bib is a must-have for anyone with young children! Whether your baby is just starting to feed themsleves, learning how to use silverwear, or just a typical messy eater, this bib will save their clothes and your mind! 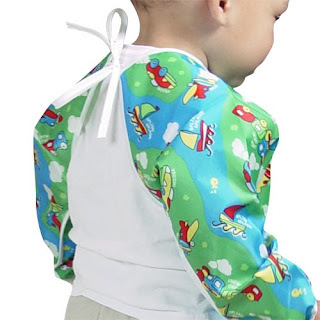 Bumkins Long Sleeved Bib is made of the a smooth waterproof fabric that is odor and stain resistant. 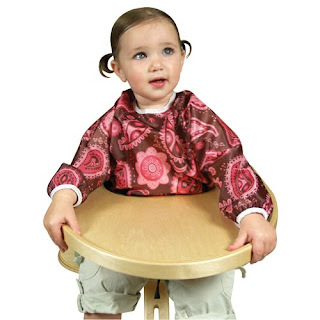 This sleeved bib closes with a tie and features a catch all pocket to keep food off of toddler's lap. 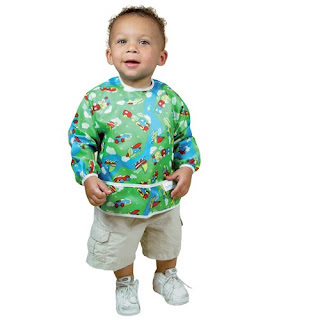 The Bumkins Long Sleeved Bib measures 13.5" across chest, 12.5" from neck down, and 32" cuff to cuff. They are generously sized and fit from 6 months to 2+ years. The are machine washable and dry very quickly so you can rinse it off after a meal and it will be clean and dry ready for the next! 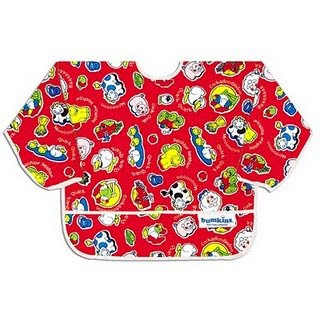 The Bumkins Long Sleeved Bibs comes in a ton of popular prints including Dr. Seuss prints! BUMKINS BIBS ARE ALL FREE OF PVC AND PHTHALATE. MADE IN THE USA Bumkins Long Sleeved Bibs are PERFECT for art projects, too! *Contest ends 2/17 at midnight and winners will be posted the following morning. Winners generated by random.org. Winners must notify annie@nickisdiapers.com within 1 week. February 4th-February 10th Weekly Giveaway WINNER! Desiree is the winner of this weeks giveaway! Congratulations, you've won a Knickernappies OS pocket diaper in celery! Please email annie@nickisdiapers.com within one week to claim your prize! BumWear Pull-Ups Training Pants 10% off! Now only $15.75! The Knickernappies One-Size Diaper is the first to snap on the side! It also comes with 2 inserts made in the USA! You may choose between the Microfiber Inserts or the Loopy-Do Inserts . Knickernappies Microfiber Inserts are made of 3 layers of ultra-thick microfiber, are absorbent and fit perfectly in most brands of pocket diapers. Use 1 for daytime, 2 for nighttime and naps. Each Knickernappies OneSize Diaper comes with a Small/Medium - 13" X 5.5" and a Medium/Large - 16" X 5.5" if you choose the Microfiber Insert. The Knickernappies 2G Loopy-Do Insert is made of two layers of hemp french terry plus two layers of super thick microfiber - these inserts can really absorb a ton. 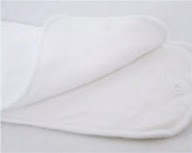 The Knickernappies 2G Loopy-Do Inserts use prewashed hemp so you can use them immediately and be washed right away with all of your diapers. Additionally these inserts are sewn in a loop so they dry super fast in your dryer. Please note they still may need to be washed a few times to achieve their full absorbency but you can use them immediately. 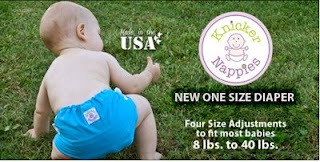 Each Knickernappies OneSize Diaper comes with a Small - 12" X 5.5" and a Large - 16" x 5.5" if you choose the Loopy-Do Inserts. Very gentle Lastin elastic in the leg and waist - no red marks! 2 Year Guarantee on elastic and snaps. Washing Instructions: For routine washing, run a cold rinse with no detergent. Then a hot wash with 1/2 the amount of detergent recommended on detergent label. Extra rinse if needed. Hang to dry or mahine dry on normal or warm setting. *Contest ends 2/10 at midnight and winners will be posted the following morning. Winners generated by random.org. Winners must notify annie@nickisdiapers.com within 1 week. Wow, ya'll are excited about the Ergo! Record number of entries this week! Please email annie@nickisdiapers.com within 1 week to claim you prize! Happy Heinys Pocket Diapers - Cotton Prints (Excluding Cow Print) !! Only $10.95 (Insert not included) All "Items of the Week" run from Wednesday to Wednesday. Children: Abby, 3, Maggie 11 mos. How did you decide to cloth diaper? I wanted to cloth diaper my babies because it's a very traditional way to parent. My grandmothers cloth diapered their children, my mother cloth diapered her children, and I wanted to do the same. My husband was on-board from the very beginning because of the environmental benefits and as he learned more, he became a big cloth diaper supporter for health and financial reasons as well. What types of cloth diapers do you use? When the babies are young, from birth to about 8 months, we really prefer prefolds. When they get to that wiggly stage, when it's nearly impossible to get them to hold still for longer than 10 seconds, we find it easier to use Sandys fitted diapers. At night, we like to use either a bamboo fitted or a Sandy fitteds with a doubler and a wool cover or longies. What is your favorite cloth diaper and why? We love both our prefolds and our Sandys. We've used the same diapers on both of our girls and find that both prefolds and Sandys are real workhorse diapers. They're still going strong! In fact, my Sandys were all obtained second-hand. Some of them have seen the bottoms of more than 5 babies by now and yet they have no wear issues at all. The snaps and elastic are fully functional and none of them are stained. For covers, we love the Motherease Air Flow covers. I'm a huge fan of snaps and gussets and my husband loves the MEAFs. What type of music do you play in the car when you don't have your children? You mean I can do that? Get out without the girls? LOL. Seriously, though, I usually dont' listen to music. I commute during the times when NPR is playing various programs so I usually listen to that. News, social interest stories, etc. What would you tell someone who is just starting out? Give cloth diapering a fair shot. Don't just buy the bare minimum to try it for a day and don't buy department store prefolds. Buy enough diapers to feel like you can make a real committment to it and make sure that the quality is good enough to not drive you batty. Also buy enough of the tools to make it easier, such as a sprayer, liners, wetbags, etc. It's only when you really put your heart in it that it becomes not only do-able but easy and enjoyable. Also, try to be active in an online diapering community. The advise and experience available there is priceless.